There are those who would say it is health, there are those who would say money, others talk about personal happiness, however I can tell you that most of the world is looking for the warmth of a good relationship and family. That is the most important thing for most of us. I have gathered this information from you. I have the great fortune to be your jeweler, I have been the silent partner at countless weddings, declarations of love, births, hard times, celebrations and tragedies. 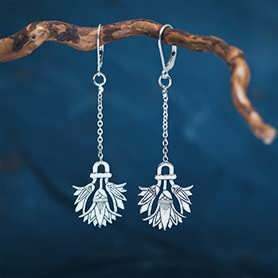 You have used my jewelry as presents of love, presents of support and presents that symbolize the vast diversity that we call the human experience. 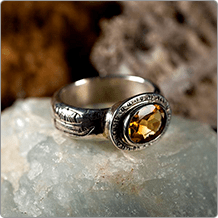 I feel great joy when you recount to me the significance that you give to the jewelry in your life. Your stories always lead me to feel that there is a huge amount of people behind me. When I work on a new model, I sometimes feel that my goldsmith table is in the middle of a huge stadium and everyone is watching me work… Indeed this is my greatest challenge- to take a cosmic symbol and to bestow upon it meaning that will touch the lives of each and every one of you on a personal level, to create jewelry that will give you strength and will bestow upon you inspiration. My latest Yin Yang design is an example of this. I used the Yin Yang symbol that represents cosmic powers that complete as well as define one another, as a symbol of love between lovers, the symbol of the male and female that completes each other. 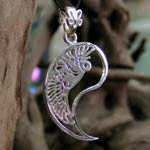 The symbol of the cranes that appears in the pendant transforms this cosmic symbol into an abstract symbol of intimacy, love, fidelity, support and long lasting life. 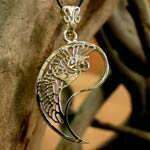 The pendant is crafted from two parts that complete one another. 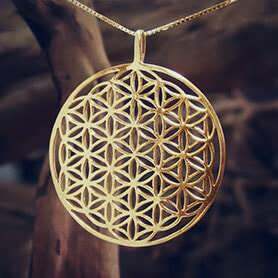 I designed the pendant so that it suits both couples and singles. 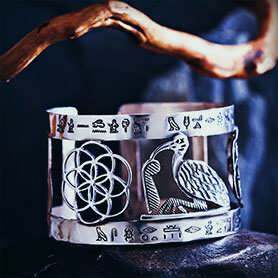 Each partner can acquire each of the pieces individually in such a way that they complete each other or a single person can acquire both symbols soldered together as a symbol of inner unity. 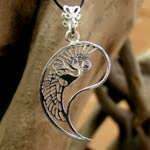 The Yin is the black part with a white dot which is represented in the pendant in the part where the crane is with the empty circle. 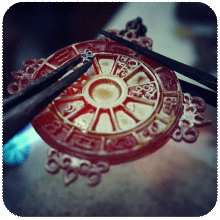 The Yang is the white part with the black dot that is represented in the pendant by the crane with the full circle. 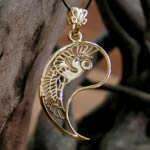 The pendant is available both in its entirety with different combinations of metals and also as a separate pendant of Yin or Yang, where each half of the couple wears his symbol. 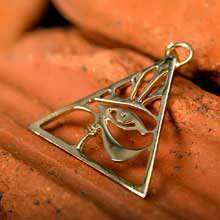 You can have your initials engraved on each of the pendants. A beautiful story that happened a year ago that demonstrates the power of cosmic symbols. Close to my workshop, works a fellow by the name of Shlomi. Shlomi lost his mate nearly two years ago. She became ill with cancer and passed away a few months later. We all were by their side and we tried to help and encourage both of them. The period after her passing was hard- they were about to get married and to raise a family and all the plans vanished in a short time. 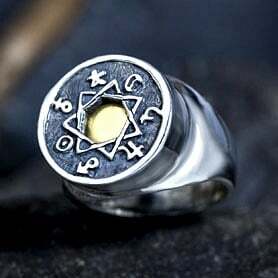 One day when I was working in my workshop, a woman named Ronit came to buy a piece of jewelry. A month later she appeared at the workshop accompanied by Shlomi that had met her in the past and ran into her on his way to visit me. I looked at both of them and for some reason they seemed to me a good match. 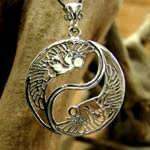 I took out two silver Torus knots and I gave them the pendants as a gifts. 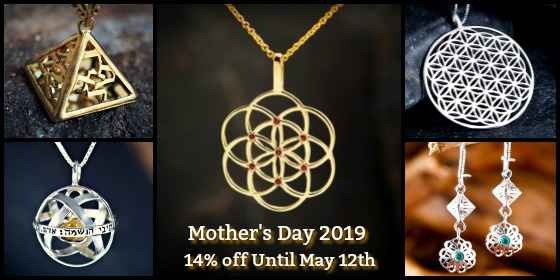 The Torus knot symbol is one of my most beloved symbols and many people buy it as a symbol of heavenly connection and oneness. The amount of amazing stories that I have collected from customers surprised me indeed, therefore I gave them the symbol without explaining too much about its meaning. 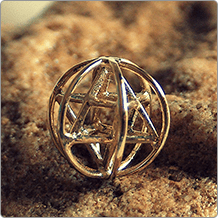 A month went by, and they both show up smiling, “ We have come to make an order for the Torus Knots as gold pendants.” It turns out that a short while after I gave them the pendants, they got together. A year later they got married and in this picture, you can see the fruit of their love (Ronit is pregnant). 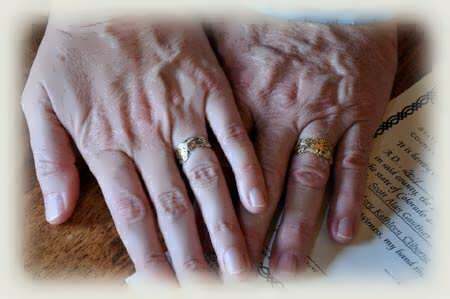 On the topic of weddings, here is a touching picture that was posted on our facebook page by Molly and Cliborne who chose to get married with the elements rings.